There are now more people searching the internet on their smart phones than on their desktop computers. This means that YOUR customers are looking for you RIGHT NOW on their mobile phones. The new generation of mobile users are seldom just randomly surfing the web. They are looking for specific information about your business, whether it be your opening hours, your location, phone number, services or what your deals are. – 95% of smartphone users have searched for local info. – 61% called a business after searching. – 90% of these users acted within 24 hours. So from these figures alone, I encourage you to start thinking differently about your business and your mobile policies. Can you afford to just bury your head in the sand? The question is no longer “Why should I invest in mobile?”, but “How should I invest in mobile?”. 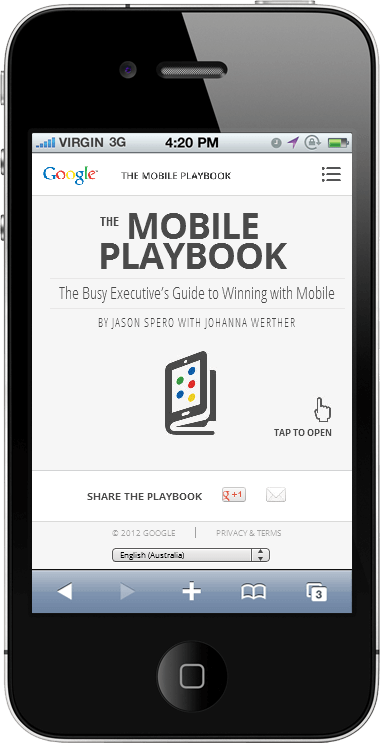 Keep an eye out for the next post in this series entitled The Top 3 Reasons Google Says You Should Embrace Mobile.